Dental Insurance is different from Medical Insurance. Many patients aren’t familiar with the specifics of their dental insurance benefits. Your dental benefits are based on the agreement your employer negotiated with your insurance carrier. The patient payment portion covered for procedures varies depending on the coverage provided by your employer. An estimate of the amount covered by your insurance company will be provided at the time of your treatment and initial consultation with your doctor. We will file all insurance claims as a courtesy to our patients. Our goal is to optimize the maximum amount of insurance you have available. For your convenience, we accept payments made with Visa, MasterCard, Discover, and American Express. 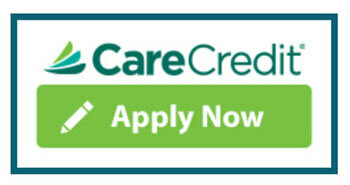 We also offer financing through Care Credit. CareCredit® is available to help you pay for dental procedures your insurance doesn’t cover. CareCredit® offers both No Interest* financing or low minimum monthly payment options so you can take care of your dental health.